Among the Folger's priceless manuscript treasures are the famous Macro plays, which contain the full texts of three of the four surviving morality plays written in English before 1500. Two of these plays, The Castle of Perseverance and Mankind, are known only through the Macro Manuscripts now at the Folger Shakespeare Library, while a fragmentary version of Wisdom also exists in a Digby Manuscript at the Bodleian Library. The Castle of Perseverance is the earliest complete extant English morality play. Without these humble manuscripts, totalling seventy-five leaves, we would know little about the once flourishing genre of English morality plays. 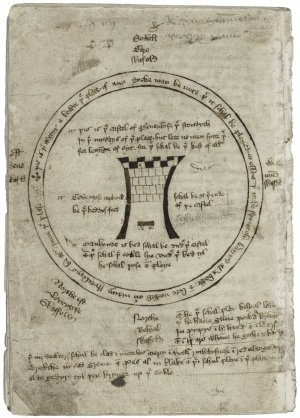 The last page of The Castle of Perseverance, for example, provides the earliest known stage diagram for an English play. The bottom right corner of the last page of Wisdom contains the statement of the scribe, a monk Thomas Hyngham, which in English reads: "O book, if anyone should . . . ask to whom you belong, you shall say, I belong above all to monk Hyngham." The three plays were transcribed as separate manuscripts. Regional dialects and references to place names scattered throughout the plays suggest that all three originate from the East Midlands, particularly Norfolk and Suffolk. The Macro Manuscript’s copy of The Castle of Perseverance was transcribed by an unknown hand around 1440. The two later plays, Mankind and Wisdom, were transcribed by the Monk Thomas Hyngman in the mid 1460s. In the early 18th century, Reverend Cox Macro acquired all three individual manuscripts and bound them together along with three other non-dramatic manuscripts. 19th century owner Hudson Gurney separated the three Macro plays from the rest of the miscellany. The three plays were first published together as a set in Furnivall’s edition of 1882. On March 30th 1936, the three plays were purchased together by the antiquarian firm of Bernard Quaritch at a Sotheby's auction. Joseph Quincy Adams purchased the manuscripts from Quaritch in August for $5,625 USD/£1125 GBP. In a letter to Amherst College President Stanley King, Adams described the decision to make the purchase in a letter dated August 29th, 1936: "I tried to get Quaritch to give the Folger Library an option for the manuscripts until September 1, but this he refused to do, for he hoped that they would be acquired for the British Museum. I could secure the three manuscripts for $5,625, and having been granted by the Trustees $10,000 for the purchase of new material, I decided to take the matter at once under careful advisement. I went to my hotel, and spent most of the night considering the matter. The more I thought, the more convinced I became that I should not let this remarkable opportunity slip through our fingers. The price was extremely reasonable; indeed, in my judgement, $25,000 would not be unreasonable. And so, early on the following morning, I took a taxi, drove to Quaritch's shop, and completed the purchase. The manuscript reached the Folger Library before I did, and created something like a sensation with Dawson, Willoughby, and McManaway. They were not only delighted, but astonished at the smallness of the cost. We all agree that the three items constitute the most important manuscripts in our keeping. Their presence here adds a new distinction to the Library, and I feel great pride in having acquired them. We stole a march on the English people!" In 2016, Richard Beadle published the article, "Macro MS 5: A Historical Reconstruction." In this article, Richard Beadle reconstructs the sequence of components in “Macro MS 5,” which students of English drama may recognize as a bibliographical descriptor of a bound volume that contained three valuable early English morality plays, but which Beadle reminds us was “a composite volume of some complexity” (66). For the morality plays, now at the Folger, and known as the “Macro plays,” were only three components of a bound volume of disparate manuscripts. The other components included Juvenal’s Satires, a twelfth-century manuscript of Anglo-Saxon laws, and several scientific and pseudo-scientific Latin texts. These manuscripts are now dispersed among no fewer than four institutions—Downside Abbey, John Rylands Library, UCLA, and the Folger. See below for full reference. References in The Castle of Perseverance to “crakows” (an early 15th-century shoe fashion with pointed toes) indicate that the play was written between 1400 and 1425, making it the earliest complete extant English morality play. Although it is the earliest play of the three, Castle, is the third play in the Macro manuscript, in folios 154-191. The play contains nearly 3,700 lines, with 38 extant leaves – two gatherings of 16 leaves and a third gathering of six leaves. Evidence of two missing leaves suggests that there are around 100 lines that have been lost. Some scholars argue that the play may have had multiple authors, due to differences in style, rhyme scheme, and stanza pattern between the banns. The manuscript is composed of thirteen leaves. The play was performed by groups of traveling players for a paying audience. The cast is considerably smaller than that of The Castle or Wisdom, requiring as few as six players to perform. The play has been noted for its low tone, bawdy humor, and the relatively colloquial language used throughout. The play is the first known play to mention money collection, so scholars have suggested that the tone of the play was meant to appeal to broader audiences. Also known as Mind, Will, and Understanding, two quires of twelve leaves each make up the manuscript.. While the play in its complete form is known only through the Macro Manuscript, fragments of the play are preserved in a Digby Manuscript at the Bodleian Library (MS Digby 133). Scholars disagree on the number of players required to perform the play, varying from over twenty to as few as twelve. Detailed copy information may be found in Hamnet . Links to full-text "Bookreader" images of the Macro Manuscript (including the individual plays) may be found at the end of that record. For further information, visit the Wikipedia article for the Macro Manuscript. Richard Beadle, “Macro MS 5: A Historical Reconstruction,” Transactions of the Cambridge Bibliographical Society XVI / 1 (2016): 35-77. Beadle, Richard and Piper, A.J. eds. "Monk Thomas Hyngham's hand in the Macro Manuscript," New Science out of Old Books: Studies in Manuscripts and Early Printed Books. Aldershot: Scolar Press, 1995, pp. 315-41. Bennet, Jacob. "The 'Castle of Perseverance': Redactions, Place, and Date." Mediaeval studies, xxiv, p. 141-52. 1962. Wickham, Glynne, ed. English Moral Interludes. London: Dent, 1976.